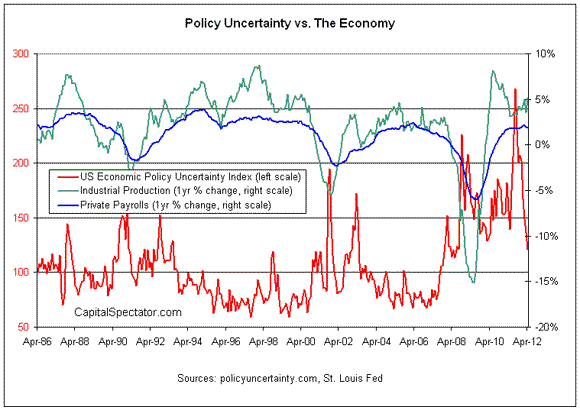 BBD’s policy uncertainty index has soared in recent years, giving ammunition to analysts who argue that an excess of doubt about the future is weighing on the economy. (For a good overview of the debate about the pace of the post-recession recovery, see John Cochrane’s post here.) The question is whether BBD’s definition of uncertainty truly captures the lion’s share of this factor. For now, let’s accept their index as a representative benchmark. 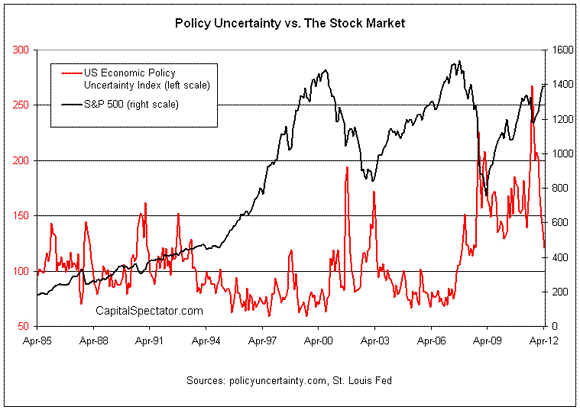 By that standard, it’s interesting to note that this policy uncertainty benchmark has dropped sharply in recent months and is now at the lowest level since just before the financial crisis exploded in the autumn of 2008. Should we now conclude that uncertainty is no longer a problem? If so, is the economy poised for stronger growth? Does anyone think that the drop in BBD’s index will translate into more support for Obama’s re-election prospects? Clear answers are in short supply when you consider that rate of growth in private-sector payrolls, industrial production and other economic indicators have already rebounded to pre-recession levels in recent history despite the formerly elevated levels in BBD’s policy uncertainty index. Is this a signal that an even stronger phase of growth awaits in the wake of BBD’s fallen benchmark? Or is there a disconnect between this index and the real economy? It seems that BBD’s index raises more questions than it answers. The drop in BBD’s index isn’t likely to change anyone’s mind, at least not until after November 6. Political uncertainty and economic uncertainty are connected, of course. The upcoming election will wipe away part of the doubt, although it’s unclear if post-election clarity will clear up the rest of the misgivings. The lesson in all of this? Uncertainty is uncertain.